How good has he been since taking the No. 1 job? One is obviously Binnington, and you'd think it's Goalie B, but those stats actually belong to Andrei Vasilevskiy, an elite goalie playing on a historically good team. The Blues have yet to clinch and have just one back-to-back, and entering Sunday, Binnington has made just 42 appearances in the AHL and NHL this season, so even if he starts all the remaining games, he should still be fresh for the playoffs. Of the Blues' remaining games, only the Knights and Avalanche are in playoff position, giving them one of the easiest finishes to the regular season. Don't be surprised if Binnington ends the final two weeks as the league's top goalie. 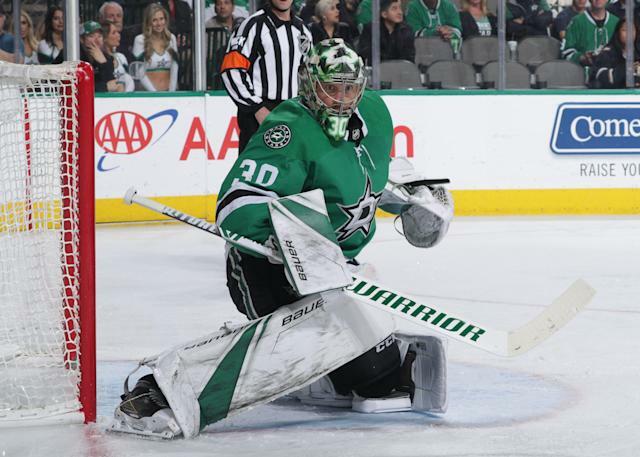 If it weren't for Bishop, the Stars wouldn't be cutting it this close for a playoff spot. Despite a slightly concerning injury history, Bishop has been the team's most steady player and MVP this season, leading the league in save percentage (.932) and coming in second in GAA (2.05). Although they have one game in hand and a two-point lead against the Avalanche, the Stars can't afford to be lax in their play. It'll be very challenging with five of their games played on the road, especially a four-game, six-day trip through Western Canada. Bishop is worth starting because he's been excellent all season, and his goal support should improve with a healthy Mats Zuccarello. According to moneypuck.com, the Canes have a 95.52 percent chance of making the playoffs, and if Mrazek keeps this up, not only will they make the playoffs, they might stage an upset against the winner of the Metro. Mrazek is 5-1-0 in March, sporting a .941 save percentage and a 1.81 GAA, taking over for Curtis McElhinney, who has struggled (.867 Sv%, 4.20 GAA) and three appearances shy of tying his career-high 32 despite being already 35. That's not an easy schedule for Mrazek, but when you're this hot, you can stonewall any team. His career save percentage against the Caps (.920), Flyers (.919) and Leafs (.913) are also surprisingly good. The Pens will make the playoffs but seeding is very important. If they don't lock up the division title and face a weaker wild-card opponent, they'll have to face either the Islanders or Caps in the first round. It's a very manageable schedule with perhaps the Preds and Canes posing the biggest challenge, and facing the Rangers and Red Wings twice each down the stretch is a true blessing. Murray, despite struggling through the first two months of the season, has compiled a 22-7-4 record with a .930 save percentage since. There are no back-to-backs and the Pens may start Casey DeSmith in one of their home games, but expect Mike Sullivan to ride Murray for the rest of the season. Semyon Varlamov was benched after four lackluster starts in which he recorded just one win and finished with a save percentage of .900 or worse in all. That's led to more starts for Grubauer, and he's wrestling away the No. 1 job with four consecutive wins and four goals allowed. Whoever finishes the season with the hotter hand gets first crack in the playoffs, and that's currently Grubauer, who is 6-3-0 with a .953 Sv% and 1.46 GAA since Feb. 1, but the Avs' schedule is pretty tough. The Oilers might be the only game in which the Avs are favored, but facing Connor McDavid and Leon Draisaitl is a goalie's worst nightmare. He's been a nice story this season and the Coyotes remain a scrappy team; difficult to score on and willing to grind out games without an A-list offensive star. It seems like there's no team they can't upset, and remember, they handed the Lightning the worst loss of their season, 7-1. The Coyotes don't have any back-to-backs, so expect Kuemper to start all of the games, except maybe the finale if they clinch before then. He has the edge against the Wild and Kings with his .929 Sv%, 2.19 GAA at home, has no edge against the Isles and Knights on the road, and faces difficult matchups against the Blackhawks, Avalanche and Jets with their talent-laden forwards. If the Habs make the playoffs, once again it'll be because Price has been stellar. His overall numbers aren't eye-popping (32-22-5, .916, 2.52), but since Jan. 1 he's fifth in wins (17), fifth in saves (837) and fifth in save percentage (.928, min. 15 starts). They have one of the toughest schedules so starting Price does require some careful thought, but talent-wise he remains one of the league's best goalies. Of the seven games remaining, only the first three seem like good gambles. Normally, the Preds are a good gamble, but perhaps the acquisition of so many potentially game-changing pieces (Wayne Simmonds, Mikael Granlund, Brian Boyle) has thrown the team's chemistry into disarray. Losing 5-0 to the division rival Jets and allowing them to take the division lead with a game in hand must've hurt, and the Blues are just two points behind them in a race to clinch home-ice advantage. The Preds have tried to manage the 36 year old Rinne's playing time this season, but it's unlikely they can take their foot off the pedal. The upside: Even if Rinne appears in all six games, he'll still enter the playoffs with the fewest appearances (57) in five seasons, and their final three games should be a cinch. You don't want to doubt the defending Cup champs, but the last four months Holtby hasn't really looked like a Cup-winning goalie with a 17-14-3 record, .903 save percentage and 3.02 GAA. You look at that schedule, with a three-game road trip against high-end offensive teams and then two final games that feature teams who like to grind out wins, you realize it's going to be tough to get wins. I like the Caps, but I find Holtby, who's 1-3-1 with 17 goals allowed in his last five games, a really dicey play, especially on the road. The silver lining is that Jones has been a much, much better goalie in the playoffs (.926 Sv%, 2.07 GAA) than in the regular season (.912 Sv%, 2.46 GAA) because his play lately has been concerning. After a 24-save shutout win against the hapless Wild, Jones lost three consecutive games and was pulled against the Knights. Of the 11 goalies who have made at least 50 appearances this season, Jones is last in save percentage (.898, the only one sub-.900) and goals against (160, tied with Connor Hellebuyck). As dominant as the Sharks have been, there are games in which they can't overcome their woeful goaltending. It should — should — be an easy schedule for the Sharks. At this rate, Quick will finish with his worst season ever, the first time his save percentage will be below .900 and his GAA above 3.00. The Kings’ final four games are two back-to-backs so Jack Campbell will see at least two starts, but with playoff hopes already dashed and Cal Petersen already playing more meaningful games in the AHL, don't be surprised if Campbell sees a couple more appearances. The Kings are awful this season and won't be competitive without significant roster moves, but keep a tab on Quick for a potential bounce-back performance next season. He's too good to be this bad again.